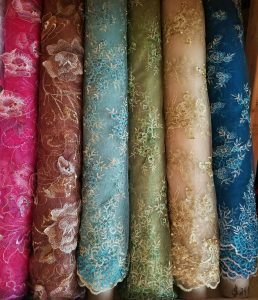 When you’re thinking about starting a project what are some thoughts on choosing “the right fabric(s)” for it? First, look online to see other people’s projects and what they used. Oftentimes, people like checking sites like Pinterest for inspiration. You can also do the “old-fashioned” thing and actually talk to other people about their projects– in person– and ask them what fabric(s) they used to create their creation(s). Basically, you need inspiration, and it typically comes from someone else who has already done something similar to what you plan to do! Next, research the specific type of garment you’d like to make and see what fabric or fabrics are typically associated with that garment. Again, you can “ask around” with others who’ve made the piece you plan to make, or look online for guidance and suggestions. When looking at fabric in a store, some things to consider include how it hangs (this is called its “drape”), its width (which helps determine how much you need), its color (and how it looks next to your skin and/or in different lighting), and how well it stretches. If you’re going for a look that is “forgiving on the figure,” you might want to buy a heavier fabric– like a heavy linen. If you want a “light and airy” look, then silk might work well. If you’re not quite sure how much fabric you’ll end up using, a good rule of thumb is to get about 2.5 yards of a fabric to “work with,” and then you can buy more later on in case you need it. As for fabric types, there are several that are tried-and-true. Light cotton, for instance, is easy to sew and works well for tops and dresses. If you have a project that you want to “have more shape,” choose heavy cotton, which is stiffer. Want to find a fabric that’s affordable yet feels expensive? Go with linen, especially for shorts or pants. Finally, silk can be a little tough to sew, but it’s also a “good challenge” to work with, and you can create pretty pieces with it. Need help choosing “the right fabric?” Contact Fabrictopia for direct advice; we offer a wide range of high end designer fabrics at wholesale rates, including but not limited to Jerry Pair, Holly Hunt, Scalamandre and Cawtan & Tout fabrics.